We sell Canned Soups, Fruits & Vegetables, Beverages (juices, sodas, etc. ), Cereals, Pastas & Bread, Snacks & Candy, Cleaning, Household & Paper Supplies, Pet Food & Accessories, Dairy, Freezer & Produce items, Bulk Foods, AND MUCH MORE! sampling of what you might find at a Sharp Shopper Grocery Outlet. 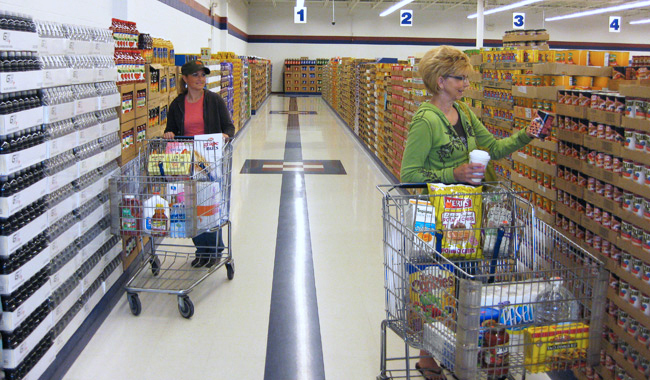 Our discount grocery outlets feature closeouts from the grocery industry. Closeouts become available because of overproduction, packaging changes, seasonal items, warehouse damage, or short date codes (click here for our Product Dating page). Our Inventories constantly change because of the changing availability of products. Customers say this adds a "treasure hunt" dimension to shopping at Sharp Shopper. In addition to closeouts, we offer fresh bread, dairy products, produce, bulk foods, soft drinks, etc. for your shopping convenience. Thank you for your interest in Sharp Shopper. We look forward to serving you and we know that you will be pleased with our quality products, discount grocery prices, and excellent customer service! Read what others are saying about us on our Customer Comments page. Our stores are open 8 a.m.
Sharp Shopper Grocery Outlets are located in Pennsylvania and Virginia. The Distribution Warehouse & Corporate Offices are located in Ephrata, PA. For more information concerning each of our locations, please use our "Locations" menu above.